The homage recipe includes mashed blueberries and blackberries, lime juice, coconut milk, gummy bears and popcorn (popcorn?!?). First, halo-halo is not a smoothie. And it’s a mix that, frankly, feels sacrilegious. 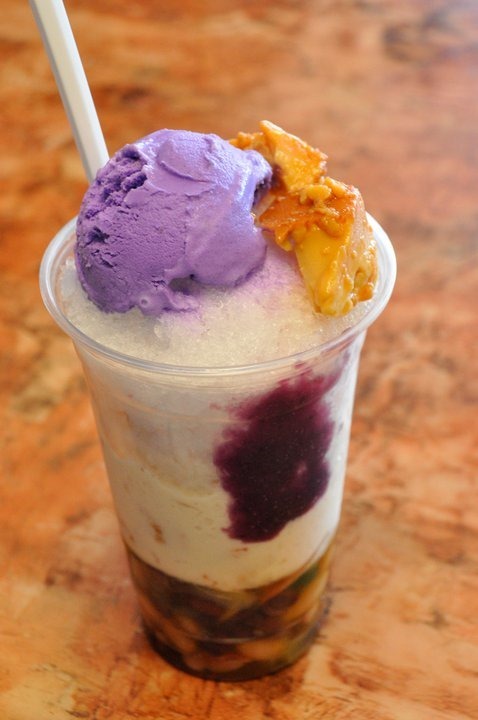 What are the actual ingredients of at least one typical recipe for Halo Halo? Imagine red and black monggo (mung beans) at the bottom; yellow from cooked saging na saba (indigenous bananas), langka (jackfruit) or garbanzos; white from evaporated milk, nata de coco, (coconut jelly), macapuno (young coconut) and kaong (palm fruit); and orange from kamote (yams). Add in the translucent and chewy goodness of sago (tapioca pearls) and gulaman (like jello made with natural agar-agar). The crunch comes from pinipig (pounded and toasted glutinous rice). Halo in Tagalog means mix – which is what you do when consuming this treat, whirling it together until it becomes one glass of beautiful purple. In other words, Bon Appétit’s version not only had none of the authentic ingredients (except for coconut) but included ingredients that taste nothing like the original. I devoted a chapter to the idea of authenticity in American Foodie. Traditions change and innovators have always been and will always be looking for new versions of traditional dishes. When cultures mix and exchange takes place there is no way to prevent, nor should we want to prevent, cultural appropriation. Change even when induced from the outside is what keeps traditions alive and growing. But if an innovation is going to count as a new extension of the tradition it must maintain some continuity with it, making modifications that are still recognizable as a modification of the original. The homage recipe might taste perfectly fine, but it isn’t a “take” on Halo Halo—it’s a new dish perhaps inspired by Halo Halo but not a version of it. This is not about being conservative. I’m OK with revolution. But don’t then call it tradition. Still, something positive might emerge. For sure, millions more in this generation of foodies are beginning to embrace Filipino food and culture. And if nothing else, maybe this fiasco will teach those who want to recreate or modify tradition to cook carefully and respectfully.